Group photograph of Jikken Kōbō, Oct 1954. Photo: Kitadai Shōzō. L-R: Kiyoji Ōtsuji, Shūzō Takiguchi (critic), Kuniharu Akiyama, Mrs. Takahiro Sonoda, Katsuhiro Yamaguchi, Takahiro Sonoda, Tetsurō Komai, Hideko Fukushima, Kazuo Fukushima, Tōru Takemitsu, Naoji Imai, Jōji Yuasa, Hiroyoshi Suzuki, Keijirō Satō. Hiroyoshi Suzuki and Katsuhiro Yamaguchi, 1953. Katsuhiro Yamaguchi, Vitorīnu: Yoru no shinkō [Vitrine: Deep into the Night], 1954. Watercolor on paper, oil on wood, corrugated glass. 65.5 x 56.5 x 9 cm. Mirai no ivu [The Future Eve], Mar 1955. Stage shot at Haiyuza Theater, Tokyo. Photo: Kiyoji Ōtsuji. 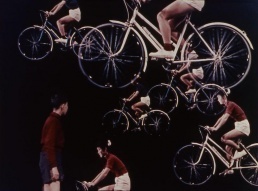 A still from Jinrin (Silver Wheel) / Bicycle in Dream, 1955. 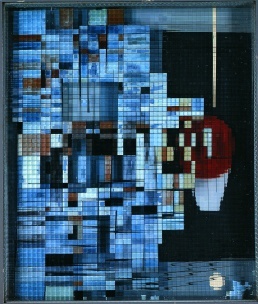 A collaboration between Toshio Matsumoto and Jikken Kobo. Video. 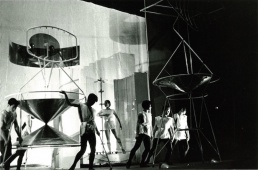 Jikken Kōbō [Experimental Workshop] was a cross-disciplinary, intermedia art collective active in 1951-57 in Tokyo. For many, the group signaled the rebirth of avant-garde art in postwar Japan. Jikken Kōbō consisted of fourteen members: the painters Shōzō Kitadai (1923–2001), Hideko Fukushima (1927–1997), and Katsuhiro Yamaguchi (b. 1928); the printmaker Tetsurō Komai (1920–1976); the composers Kazuo Fukushima (b. 1930), Keijirō Satō (1927–2009), Hiroyoshi Suzuki (1931–2006), Tōru Takemitsu (1930–1996), and Jōji Yuasa (b. 1927); the poet and critic Kuniharu Akiyama (1929–1996); the photographer Kiyoji Ōtsuji (1923–2001); the lighting designer Naoji Imai (b. 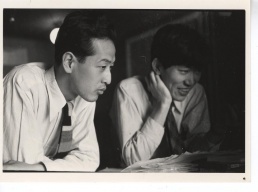 1928); the pianist Takahiro Sonoda (1928–2004); and the engineer Hideo Yamazaki (1920–1979). 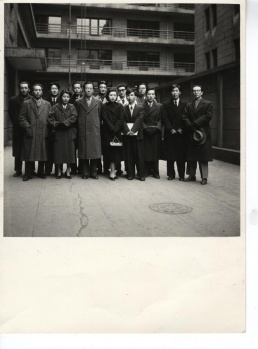 Experimental Workshop: Japan 1951–58, Annely Juda Fine Art, London, Oct-Dec 2009. Miwako Tezuka, "Experimentation and Tradition: The Avant-Garde Play: Pierrot Lunaire by Jikken Kōbō and Takechi Tetsuji", Art Journal 70:3 (Fall 2011), pp 64-85. Doryun Chong, "The Dawn of Cross-Genre: Jikken Kōbō and Gutai", in Tokyo 1955-1970: A New Avant-Garde, ed. Diana C. Stoll, New York: Museum of Modern Art, 2012, pp 46-57. Tachibana Takashi, "Takemitsu Tōru: Ongaku sōzō eno tabi" [Takemitsu Tōru: The Journey to the Creation of Music], pts. 1-18, Bungakukai [Literary World], Jun 1992-Dec 1993. Peter Burt, "Experimental Workshop: The Years of Jikken Kōbō", ch 3 in Burt, The Music of Tōru Takemitsu, Cambridge University Press, 2001, pp 39-49. Andrew Maerkle, Natsuko Odate, "Every Future Leads to Its Own Past. Katsuhiro Yamaguchi: Interview", Art iT, c2010. This page was last modified on 26 October 2018, at 16:04. This page has been accessed 6,610 times.